This was another of those recipes that got me a side-eyed look from J when I told him what it was. Cherries?? Yes, dear. There are cherries in there. Along with the chipotle flavor that you love so much. Trust me! A lot of what I make is just as much of a surprise to me as it is to him, being that I’ve never made or eaten a majority of what we’re eating, before. Fortunately I know what we like so it’s rare that I choose something we won’t both like. I’m not normally a coleslaw kinda gal, but this one didn’t have a lot of mayo in it and it had lime juice. I mean, come on…that’s about all I need to know. It was freaking delicious. And then the sweetness from the cherries combined with the heat of the chipotle made the pork so, so yummy. J is lucky that I love him and that I like to share…I could have eaten all of this myself!! And the fact that it’s made in the slow cooker is an added bonus. It is 100+ degrees these days, ya know? Turning on the oven less is definitely welcome! Rub pork shoulder evenly with salt and pepper. In a large skillet, heat oil over high heat and brown all sides of the pork, about 3 minutes per side. Then place the pork in your slow cooker. In a medium bowl, combine the ketchup, apple cider vinegar, brown sugar, chipotle peppers, adobo sauce, and cinnamon. Mix well and pour over pork roast. Add the cherries and garlic, cover, and cook on low for 8 hours or on high for 4 hours. Meanwhile, make the Cilantro Lime Slaw by combining the canola oil, white wine vinegar, cilantro, lime juice, mayonnaise, salt and pepper in a large bowl. Whisk to mix well. Add the coleslaw and toss to evenly coat coleslaw with dressing. When pork is finished cooking, shred with two forks or in a stand mixer with the paddle attachment. Return pulled pork to slow cooker and stir to coat with remaining cooking juices. 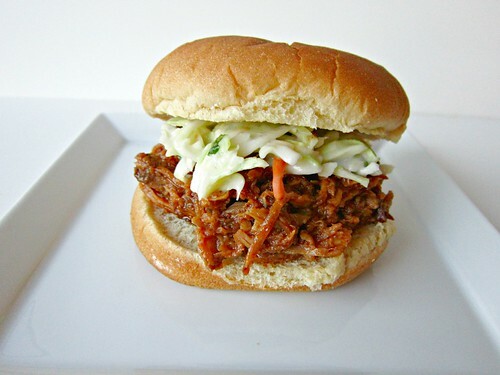 Serve on slider buns, topped with slaw.